At kosher-certified café Hasiba, a passion project from Alex Phaneuf and Or Amsalam (co-owners of Culver City’s popular Lodge Bread), pita and hummus are given the star treatment. The hearth-baked pocket bread is made from whole grains, while the silky hummus comes enhanced with earthy veggie options like roasted mushrooms or ful, a lush fava bean stew. To wash it down, have a slushy granita ($4) in strong coffee or sweet watermelon flavor. 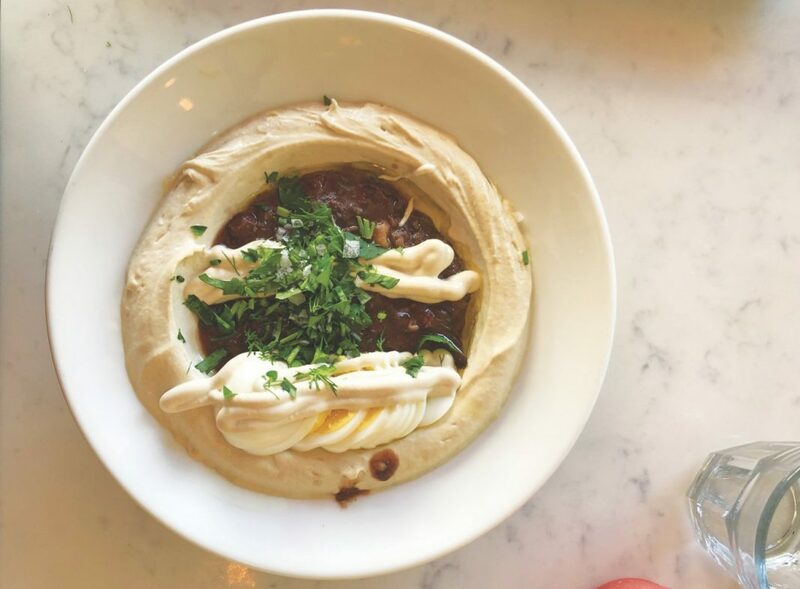 TRY THIS: Inspired by hummusiya, Israeli hummus restaurants, Hasiba offers complimentary bowls of raw white onion for dipping (the onion’s sharpness cuts the rich hummus beautifully). HOT DEAL: The beloved Israeli street food sabich ($12) makes a welcome appearance— a split pita fattened with slices of fried eggplant, hard-boiled egg, fries, pickled cabbage, the tart mango sauce amba, and a handful of chopped herbs. Hasiba, 8532 Pico Blvd., Pico-Robertson.